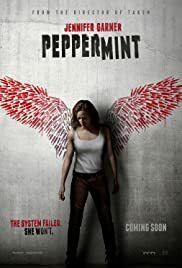 Peppermint is the hottest action-vigilante movie you can view this September 2018. The movie shows Riley North (Jennifer Garner), a wife and a mother who has a great time in a carnival with her husband and daughter when suddenly a group of thugs who works in a drug cartel killed her husband and daughter. Riley North was shot as well but did survived and when she recovers from her wounds in the hospital, she was devastated to found out that her husband and daughter are dead. This is going to be an amazing movie considering that the police and authority who are investigating the crimes are being controlled by the drug cartel as well. In fact during an investigation, one of the investigators just gives money to Riley North in order to bribe her and move on with her life. Furthermore since Riley North saw the killers who were shooting her daughter and husband, the moment the authorities show her the suspects, she recognize them and point them as the shooters. However, during trial all of the people who work in the court are controlled by the drug cartel from the lawyer, the police, judge and the prosecutor. And so Riley North was devastated and must use her pain to get revenge of those people who killed her family. She disappeared in the community for five years and she returns to kill all those responsible for killing her family. The movie is full of action, great shooting scene and above great vengeance movie. Absolutely stunning! !